A goose longs for a place to belong in this rhyming, based-on-a-true-story picture book from Blumer (Wooly Meets the Chickens, 2015). 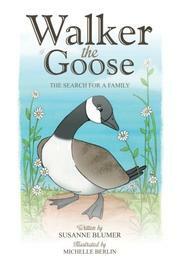 All Walker the Goose wants is to find a mate and start a family. When she lands on “the most pretty farm she’d seen in all the state,” she knows that this is where she wants to make her home. But how to start a family? In typical preschool picture-book fashion, the tale follows Walker as she meets the different animals on the farm: a cow, a sheep, and a pig. Walker asks each of them for a place to stay in a sweet and sheepish, slightly altered refrain: “I need a place to stay. / I won’t get in the way. / Could you kindly find a wee small space for me?” But each animal reminds her that she’s a goose, not a cow, a sheep, or a pig; if she desires her own family, she needs to find a gander. Mrs. Pig encourages Walker to hang onto her dreams and never give up, but the poor goose becomes heartbroken. She loves the farm, but she can’t find a mate. Luckily, Walker wallows in her despair for only a couple of pages before a handsome gander shows up. In an echo of Walker’s initial response to the farm, where she “fell in love with what she found,” the gander has the same experience—only the object of his affection is Walker. While it doesn’t offer much tension, this sweet, inventively rhymed story delivers plenty of opportunities for lap readers to chime in with animal noises. Walker’s clumsy antics—she lands on a sheep and crashes into the barn—should make young readers giggle. Berlin’s charming illustrations are semirealistic; while the animals have humanized expressions, they are definitely real creatures rather than cartoons (with the exception of the stars around Walker’s head when she hits the barn). Animal lovers should enjoy this farm title, and Walker’s story, told in a consistent AAB CCB rhyme scheme, is calm enough for pre-bedtime reading. An appealing tale of good things coming to geese who wait.